One of the few remaining devices in Samsung’s Galaxy A-series for 2019 that had none of its specs leaked is the Galaxy A10. That is, until now, as this phone with model code SM-A105F has now been spotted in a benchmark. Since the naming scheme of Samsung’s next-generation A-series became clear through a series of trademark applications, we have essentially been playing a game of bingo. Several of the new devices already had some – or most – of their technical details leaked, such as the upcoming Galaxy A20, A30, A40, A50, A70, and even the Galaxy A90. Missing was the Galaxy A10 a.k.a. 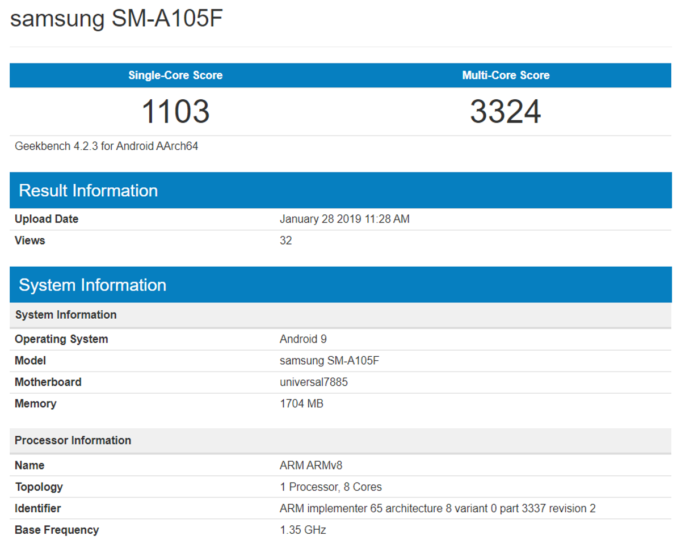 the Samsung SM-A105F, but Geekbench just demystified even that phone. To be precise, we see a device running Android 9. Samsung’s own Exynos 7885 is present, running a surprisingly low clock speed, hinting at the possible use of the recently launched Exynos 7904. The clearest indication that the Galaxy A10 will be the cheapest device in the new series, is the presence of only 2GB RAM. In 2019, this is very minimal, and it would only be properly explained by a very friendly price tag. After all, even the freshly unveiled Galaxy M10 packs 3GB (do not forget to check out our hands-on with the M10, by the way). We do not know when Samsung will launch the Galaxy A10. The presence of Android 9 out of the box suggests we will have to wait until after the Galaxy S10 launch on February 20. In short: we are likely to see the A10 and its bigger and bolder siblings sometime in the coming spring. Though we previously could confirm some of the new A-series phones will make it to Asian and European markets, we do not at this moment have such information for the Galaxy A10. Only patience, as usual, will bring us more information. 2GB RAM in 2019? This is why Samsung will never gain market from Chinese brands.